Hikigaya Hachiman has more-or-less managed to survive high school so far and all the curve balls it has thrown at him. However, despite settling nicely into the Service Club and seemingly getting along with his fellow club members Yukino and Yui, there is much turmoil beneath the surface of both the club members and his other fellow classmates. It’s only a matter of time before these issues begin to crop up and life as he knows it begins to crumble. The cast of characters in SNAFU, which includes the members of the Service Club but also extends to several other students in the school, was a relatively diverse group of characters, and many of the primary players received what I considered at the time of the first season to be a very reasonable amount of development. However, the second season drastically improves this both in its animation (which is clearly more high-end) and in its characterizations. To say that SNAFU 2 adds to the development of its cast would be doing a great disservice to the series; it completely outdoes its predecessor in this area, adding details and indicating nuances that can do anything from increasing my perception of the characters to completely subverting my initial interpretations. SNAFU adds to its development of old characters, but also introduces new players with their own complex behaviors and motivations that are interesting in their own right while also serving to further the exploration of the previously established members of the cast. One example is the underclassman Iroha Isshiki, a girl who mires her own self-worth in her interpretation of how others view her and thus changes her visible behavior to meet certain expectations. While this characterization seems vague and potentially applicable to other members of the cast, Iroha differentiates herself by deliberately and systematically manipulating others to achieve her own ends and does so in a way that is both entertaining and drags the members of the Service Club into a conflict of their own. This use of new, engaging characters to push the development of ones previously established is a significant strong point of the second season of the series. 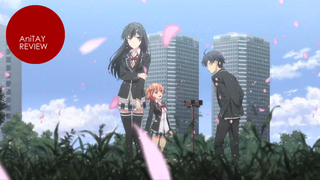 The depth of the characterizations introduced in SNAFU 2 is provided for a specific reason in the direction of the narrative: at its core, the series is an exploration into the minds of high schoolers, including their behaviors and motivations, and thus the cast of characters are explored so heavily in order to fully immerse the viewers in this mindset. I found that SNAFU 2 was fascinatingly accurate in its portrayal of various psychological situations in various types of teens as each member of the cast is explored as a very distinct individual, allowing the viewers to witness the behaviors as well as understand on a deeper level why the characters chose to act that way. Very little about SNAFU can be explained easily in just one sentence, and the outstanding depth is perhaps the greatest strength of the series. The primary way that SNAFU 2 explores the inner thoughts of high schoolers is by putting its previously established characters and new additions to the cast through situations that draw out their mental processes into physical reactions. To put it simply, there is a lot of drama. This results in a variety of new interpretations of characters, including a breakdown of Hachiman’s supposed general rejection of society and seemingly uncaring attitude towards the world around him, which is how many of the original season’s viewers interpreted Hachiman initially. While some viewers might feel polarized by the shift in perspectives from the first season, I found this change to be a very unique shift in storytelling that is very uncommon in anime, and it was handled very well. In the previous season of SNAFU, the comedic moments and general deconstruction of how a romantic comedy ‘should’ happen were the highlights, and while it is true that these elements take a backseat in the second season, they are still present and serve to accentuate the rest of the drama quite nicely. If the first season was 30% drama and 70% comedy, then the second season would be 70% drama and 30% comedy. However, despite this the 30% comedy that is still present is excellently written and just as amusing as before. If you’ve ever taken a high school English class, you’ve likely heard a teacher say something along the lines of ‘showing instead of telling’ being a better way to write an analysis essay. While I believe that showing is an element entirely acceptable in the animation format, when a show manages to convey the exact same amount of information (or even more) through ‘showing’ than if it had just ‘told’ it all, the writing is clearly a wonderful asset to the series. However, SNAFU 2 has actually had to make me redefine this general belief because it emphasizes showing instead of telling so substantially for such complicated mindsets that it can actually be detrimental at times to potential viewers, especially those who enjoyed the first season primarily for the comedic aspects of the writing. Very little is ever ‘told’ to the viewers at all; instead, they must completely draw their own conclusions based on the myriad of evidence, both obvious and abstract, that the show offers. This is a very interesting way to handle this, and the writing pulls it off quite well, but the fact remains that it is very, very difficult to fully wrap your brain around everything the show has to offer, and many viewers might potentially be turned off because they have trouble understanding the underlying motivations of the characters that drive the main plot of the series. There is really only one substantial part of SNAFU 2 that is entirely a negative thing, in my mind. The ending. I call it the ending, but it would be more accurate to say the lack of an ending, because unfortunately the series adapts all the way up to where the source material light novel series is, even though the light novels have yet to end. Needless to say, the point they chose was hardly an ideal ending point, especially since in the anime industry there is no guarantee that the rest of the series will ever be made into an anime. If anything, the series ended with even more questions than before, and several of the character conflicts, including the primary ones, were not even remotely resolved. This was unfortunate because it most definitely hurt what was otherwise an excellently-written story. My Teen Romantic Comedy SNAFU TOO! is a vast improvement on what I would argue was already a great series. Previously established characters gained new depth, and new ones added to the strength of an already strong cast. The transition from primarily comedy to primarily drama, while slightly polarizing for some original fans, benefited the narrative substantially. Despite there being little in the way of resolution, I would highly recommend SNAFU’s second season to any anime fan who enjoys a dramatic and thought-provoking character-driven story. My Teen Romantic Comedy SNAFU TOO! is available for free and legal streaming on Crunchyroll.